Jesus does not want us to have any form of anxiety and this is why he says to us that we are to give it all to him. We are not to tolerate anxiety and worry in this realm that we are living in. When tempted to flee the pressures of life, the Scriptures call us to hide ourselves in God. 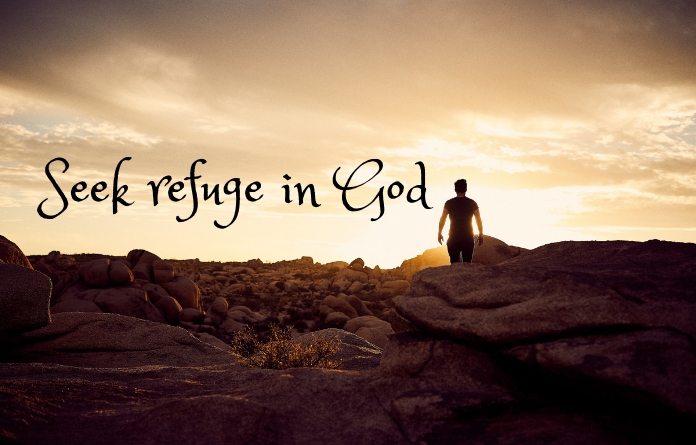 Only God can offer true refuge from life’s dangers and the misery of our sin. The coldest and darkest part of the night is right before dawn. When dawn breaks, light shines forth and the temperatures begin to climb. God gives a new beginning each and every day, a fresh start. But in the hours before the dawn, the darkest hours, tragedy, heartbreak, disappointment, and grief can pull us down into the abyss. At times it seems almost impossible to come out of it. These are the times that we must reach out to God and let him infuse His light in our lives. It’s a choice for us to make. You may feel that you can’t “If you can?” said Jesus. “Everything is possible for him who believes.” (Mark 9:23 NIV). No matter what your situation is today, whatever difficulty and distress you face, take refuge in God, his words “As for God, his way if perfect, the word of the Lord is flawless. He is a shield for all who take refuge in him.” (Psalm 18:30 NIV) He will be there for you with love and mercy that only come from Him!